Arhur Ferrante and Lou Teicher remain the "Kings of the twin pianos," which tour annually to more than 115 cities throughout the U.S. and Canada, with concert bookings filled two years in advance. Major symphony dates and recording sessions take what little time is left! In this album, the setting can be no more lush than paradise. Ferrante & Teicher on their twin Baldwin Grands, and their orchestra conducted b the magnificent Nick Perito, glide seductively through Misty and Shangri-La. Their famous prepared piano technique (in which the natural sound of the piano is altered) sets the mood for Taboo. As is the Ferrante & Teicher trademark, classic standards such as the lovely Clair De Lune, Moon Of Manakoora, Flamingo and Adventures In Paradise, have been included in this tropical collection. 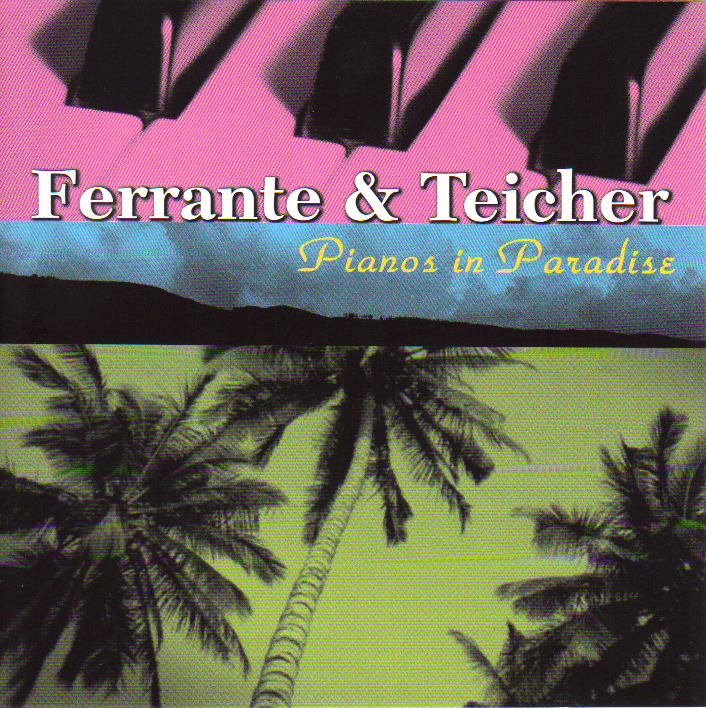 Hear then "Pianos in Paradise" by Ferrante and Teicher! I find this compilation more than a bit frustrating! Why didn't EMI simply reissue the original Lp Pianos In Paradise intact with the original artwork and liner notes? Instead they substituted three of the original selections ("Misty," "Claire De Lune," and "Negligee") with "Temptation" (from Our Golden Favorites), "Far Away Places" (from Holiday For Pianos) and "Quiet Village" (from Golden Piano Hits). Why? Some new notes explaining the decision would have been helpful. To make matters worse, there are imperfections in the sound. I believe they could have purchased a 7 1/2 ips reel-to-reel tape from eBay and have created a better sounding compact disc.